Cocoia Blog » Acorn’s out. Acorn, the new image editing program from Flying Meat is out. I found that out just now, as I was rubbing my eyes having just gotten out of bed. This gives me the chance to give a very educated blog post before anyone, uh, more witty can. Acorn, as you can see, features the conventions we all know in image editors; we have tools, we take them from a palette to draw on a canvas. The result, for most image editors, is a screen akin to an airport where everything is up in the air and floats about your canvas, often obscuring parts or confusing you what palette to go to next. Acorn takes a very clever approach to this (does Gus know any other ways of approaching a hideous problem? ); it puts the layer, tool, and color palettes into one. As you can see, this even features the tool’s options neatly in the right place. 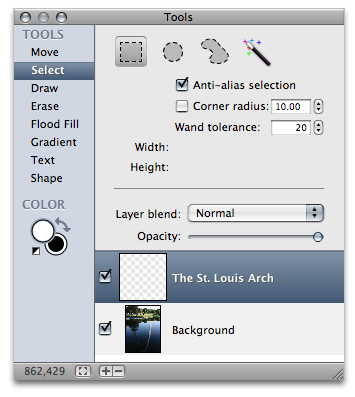 I’d kill for a version of my favorite image-editing gorilla with such a smart approach to reducing workspace clutter. But smart placement of the things you need isn’t where Acorn’s features end. Gus has done well in keeping Acorn a simple and intuitive image editor you can just jump into. GPU (or hardware) acceleration, something that Pixelmator, the next hot thing in image editing land, boasts with, is something Acorn modestly lists in its feature listing. It has an intuitive feature for creating gradients, it smooths your pencil strokes, features a very nice fullscreen mode and much more. Testing Acorn has been a very joyful experience for me, as Gus is very receptive to input and Acorn itself is nothing less than a joy to use. I’m happily buying a license for my girlfriend when I’m getting my next payment. It’s a mere 39,95 – as introductory price. You can test it out yourself or buy it now from his website.